In July this year, Microsoft decided to ditch Android based handsets and started focusing only on Windows based eco-system. Hence, presently, they are not manufacturing or selling any Android device. But despite not selling any Android device, Microsoft stands to make close to $8.8 billion per year from Android OS by 2017. But the question is, why Microsoft is getting paid for Android OS? Welcome to the world of patents. In 2012, a jury in San Francisco, USA gave verdict that Google has unethically used patents developed by Oracle and Microsoft while creating their flagship Android OS. By this time, Android had become quite popular, and dozens of vendors manufactured Android based handsets, and their sales were brisk as well. Instead of fighting a lengthy lawsuit against these vendors and Google, Microsoft decided to license Android based patents to these vendors. Hence, under this legal agreement, Microsoft signed licensing agreements with 20 vendors who were manufacturing and/or selling Android based handsets; which included all major companies such as Samsung, LG, HTC, Acer and more. 793 million handsets powered with Android were sold in 2013, and as per Gartner estimate, more than a billion Android handsets would be sold by the time 2014 ends, with Android capturing 84% of the overall smartphone market. Some estimates peg this licensing fees to be in the range of $5- $15 per handset, which makes the profits exponential. Although Microsoft or Android vendors never revealed the exact patents which are being licenses, it came out in the open incidentally in China. During finalizing the Microsoft-Nokia deal worth $7.2 billion, Chinese Govt. required them to furnish details of patents which are being sold to Chinese vendors. As a result, all the patents are uploaded in their website, which can be viewed here. By 2017, it is estimated that 1.5 billion Android handsets would be shipped globally, and considering that Microsoft has sold licenses to 75% of all Android manufacturers and vendors, $8 – $9 billion would be pure profits for Microsoft from Android devices. Infact, last year, Samsung paid Microsoft $1 billion for using Android OS. But after the Nokia deal finalized, Samsung has stopped paying Microsoft. The issue is being resolved in court right now. None the less, it’s a wind-fall gains for Microsoft, from an operating system which outsiders feel as a threat to Windows. 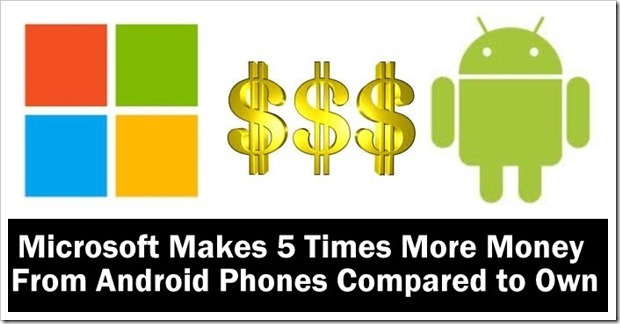 In fact, the income from Android is almost 5 times that from Windows based phone. With such huge amounts coming in to Microsoft, without even selling a single device, no wonder Microsoft loves Android! "Microsoft Makes 5 Times More Money From Android Phones Compared to Own", 5 out of 5 based on 1 ratings.